I’m really not much of a glamour girl – it’s all a bit too ‘high maintenance’ for my liking. For the last seven years, though, one of the responsibilities I’ve had in my day job at the medical college has been to organise the bi-annual formal dinner for the New Fellows. This is a black-tie affair in a five-star London hotel. Hence, twice a year it is necessary for me to get into a ‘Posh Frock’. I’ve come to the conclusion that these women that look fantastically glamorous all the time don’t actually do anything at all – they just sashay around looking gorgeous. When I try and get all glammed up, it really doesn’t work out well. Consequently, though I’ve gone through a few posh frocks over the last seven years, I don’t have a wardrobe full of them, which more glamorous women might have acquired. A few years ago I had a lilac dress full of sequins. I bought a pair of spangly sandals with kitten heels to go with it (another point – me and fancy shoes don’t get on either, but more of that later). Every time I wore the dress, I managed to get the hem of it stuck in the spangles of the shoes, and the thing was full of loose threads. I also kept losing the sequins. Once, I managed to put the heel of my shoe through the chiffon inside lining. But this was hidden under the main layer of the dress, so you couldn’t see the rip. I did manage to get about four or five wearings out of this dress, but when I had my wardrobe detox a couple of years ago with the stylist, she made me get rid of it. In fact she looked faintly horrified when she pulled it out of my wardrobe. I’m still not exactly sure what was wrong with it – apart from the fact that lilac is apparently not my colour. Armed with new style knowledge, I went and got another dress for the next dinner. This was a midnight blue long number with Greek-like folds. I had been told this was one of my colours, and I thought the dress looked nice. It was quite expensive, too – first time I’ve ever paid three figures for an item of clothing. I wore it twice that winter – once to the dinner, and once to the formal dinner dance that Hubby’s scuba diving club put on every Christmas. We have to travel by public transport into central London for the latter. On the escalator down to the underground, the long dress got caught in the escalator mechanism, and fearing being pulled into the machinery I had to yank it out hard to free myself. Miraculously the dress didn’t rip – synthetic fabric is hardy stuff – but it was all pulled out of shape and ended up with a fair bit of black oil all over it. I objected to paying over £100 for a dress I only got two uses out of so I was determined to wear it again. My mother in law managed to work miracles with white spirit and got the oil out of it, but nothing could be done about the rather mis-shapen hem line. As it happens I now can’t fit into this dress – it’s a size 12. I’m a size 14 nowadays and I can no longer get the damn thing zipped up. So I think I have to say goodbye to it, wonky hemline and all. My latest posh frock is a black and white silk prom dress that I bought for a friend’s birthday party last year (she had a ’60s glam’ theme). Then I wore it to the dive club dinner last year. We had to take the train into London, as usual, to get to the venue. On my way to the train station I fell over because I was having trouble walking in the shoes, and now it has a couple of black marks on it. I deliberately chose shoes I thought I could walk in, because I hate having to take a bag full of shoes to change into when I’m going out of an evening. Clearly I was wrong. Is it too much to ask that someone invent girl’s shoes that it’s actually possible to walk in? And just how are you supposed to keep these damn dresses clean until the end of the evening? If I don’t fall in the mud, I end up spilling my dinner down them. We’ve had a reshuffle of responsibilities at work and the organising of the dinner has now passed to someone else, so hopefully I won’t have to keep investing in posh frocks. Just as well, really. Evidently staying neat and clean of an evening is completely beyond me. I guess I’m just not a ‘posh frock’ kind of girl. There are many writing-related things on my “things to do before I die” list, and most of them have been on there a very long time. Some I have been fortunate enough to achieve. The first time I got a story published I was able to cross that one off. Getting the first novel contract was another. The final file of my first published e-book arriving in my ‘in’ box was a momentous event. The proof of the first print copy of SOUL SCREAMS was a thrill that surpassed even that. 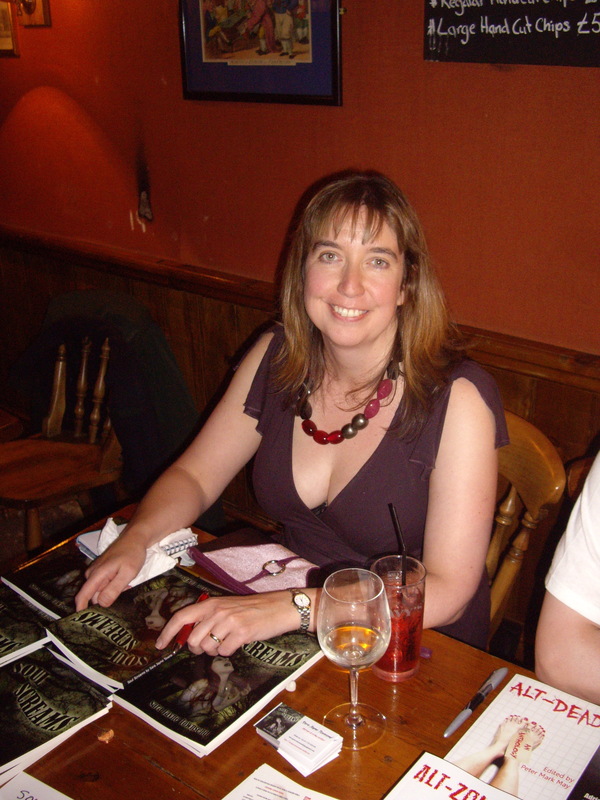 And being able to have a ‘proper’ launch, with books I could sell and sign, was another big moment. This I achieved this past weekend, when SOUL SCREAMS launched at the BFS social event. All this preamble is to give you an inkling of how big a deal this event was to me. I’d been anticipating it for weeks. I had the books. I’d been stockpiling change. I’d got promotional post cards and posters printed. I’d been pimping the event all over the Internet. I’d thought about what to wear. So I went running back to my wardrobe. Within minutes every dress I owned was laid out on the bed. Eventually, with his help, we decided on the versatile purple wraparound number that I’ve always been very fond of. With outfit decided, I went to finish packing my bag. It already had all the books in it. And it was very heavy. As I’d elected to take a backpack, I picked it up and realised that if I hefted this through London I was likely to get backache at best – at worst, it would keep pulling me over backwards. So I thought about the small wheeled suitcase that we take as hand baggage on trips. That could be pulled along and was probably a better bet. Unfortunately retrieving it meant a trip into the attic. In hindsight, it would have been better to think about this before putting on the dress and tights. Fortunately, the bag was retrieved without damage to the outfit, and once my books had been transferred to the new case, I was ready to set off for the train station, happily trundling my case of books behind me. Luck was on my side that day – no delays, engineering works or cancellations to hinder my journey, and I arrived at the Mug House ahead of schedule, about 3pm. Also launching that day were ALT-ZOMBIE, the latest book from Hersham Press, and a new collection of MR James stories, published by Jo Fletcher books and edited by Steve Jones. With these luminaries of the British genre publishing industry present, I couldn’t help but feel a bit intimidated. I put up my posters, scattered the promotional postcards over all the tables, unpacked my books and set up shop next to Peter Mark May, publisher of Hersham Press. And for a while, the two of us watched everyone flock to buy the M.R. James (which was lovely, I have to say). But Steve and Jo, who were the headline act, so to speak, did make a point of telling the enraptured audience that the BFS had always supported emerging writers and new publishers, and so they should go buy our books, too. By and by people did come to see me, and they came to buy copies of SOUL SCREAMS. Some of them were friends, not members of the BFS, who were there specifically to show moral support. That was nice. Others were BFS members who’d heard about my launch, and might have come to the event anyway, but wanted to buy my book as well. But there were also a couple of people I didn’t know – BFS members who’d come to the event, picked up the postcard, and come over to investigate. I also sold a copy to Michael Marshall Smith. That was, I admit, a bit of a fan girl moment. Then there were the lovely members of the T Party Writers’ Group. There was a meeting going on that day – one I’d given apologies to, since I was at the launch instead. After the meeting finished, they came to the pub en mass and most of them bought a copy of the book. In the end, I sold all the copies I’d brought with me, and I left a very happy bunny indeed. It’s nice to know SOUL SCREAMS has begun its publishing life with such a flourish. And with the launch over with, that’s one more thing to cross off the ‘bucket list’. There was a weekend earlier this year when we were rather busy with social events – a 40th birthday party to attend on the Saturday, followed by a wedding on the Sunday. The birthday party had a theme of early 60s glamour. Nothing in my current wardrobe seemed to be appropriate, so I was obliged to go out and buy a new dress. 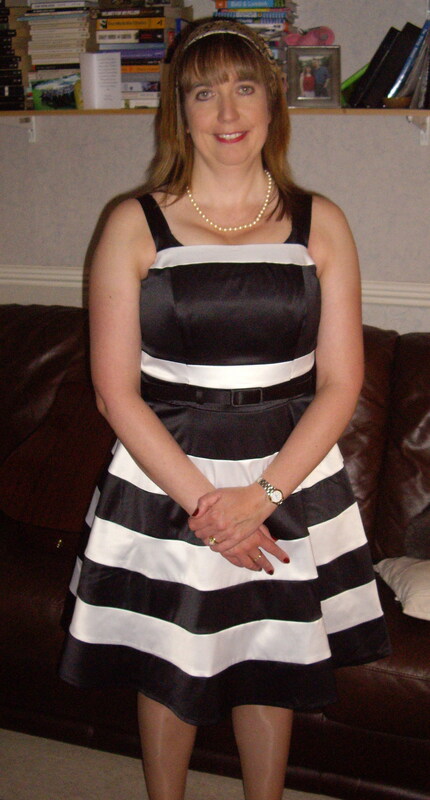 I eventually found a black and white prom dress from Bravissimo, which I thought was appropriate to the era. It was a nice dress, but it proved to be uncomfortable to wear. The bodice is quite restricting, so I had to sit up straight. There’s a lot of lace going on under the skirt to make it stick out the way it does, so sitting down requires a great deal of care. I didn’t want to go out and get shoes – I hate shoe shopping – so I wore my patent leather court shoes. I will say at this point I hate all women’s shoes. The only shoes I can wear that don’t hurt my feet in any way are trainers. If I wear shoes with heels, they make me fall over and I get burning pain in the balls of my feet. If I wear flat shoes, they rub my feet and give me blisters. At least they do for a couple of years, until the leather gets worn and soft, by which point the shoes are looking a bit shabby. The following day, for the wedding, I wore a mauve dress I’ve worn to other weddings. And the same shoes – because I really haven’t got many pairs of shoes (for reasons cited above). The wedding invite said the ceremony was at 12pm. So I had to start getting ready fairly early, to do the whole hair and make up thing, which I don’t normally bother with. There was a big gap between the ceremony and the rest of the celebrations, and since the venue was rather cozy, the group I was with decided they’d rather spend time in the gardens of the venue. We’d had a lot of rain the week before the wedding. Every time I walked over the grass, my stiletto heels sank into the mud, making it even harder to walk. By about 6pm Hubby was commenting that I was decidedly grumpy. Yes, I was. I’d been wearing the uncomfortable shoes by several hours by that point, and my feet were killing me. I tell this story to illustrate why I don’t ‘do’ glamour. Shoes I’ve already mentioned. Having a reason to put a nice dress on once in a while is fine, but I find doing so a great effort. You can’t slouch in a nice dress as it’s unladylike, so I have to remember to sit up straight. If I have make-up on I have to remember not to rub my face, and I hate lipstick marks on tea cups and glasses, which is why I generally don’t wear it. Wearing make-up also means I can’t fall into bed at the end of the evening; I have to spend extra time taking it off and cleansing my face before I can go to bed, to a avoid waking up with a face full of spots – on top of all this I have sensitive skin, and it reacts to make-up if I keep it on too long. And have I mentioned I’m allergic to perfume? I just can’t wear it; it sets off the asthma. A fancy frock also means tights. It seems I can’t wear a pair of tights without them getting laddered in ten minutes. I’ll snag them against something, or I’ll pull them up a bit too vigorously when I use the bathroom. And this is assuming I’ve managed to make it out the front door without one of the cats getting her claws snagged in them. Then there’s nail polish. It takes half an hour to put on and dry properly, only for it to chip the moment I do anything with my hands. Opening the tin of cat food. Putting the door key in the lock. Even rummaging around in my hand bag seems to chip nail polish. So on the whole I can’t be doing with this ‘glamour’ business. It requires far too much maintenance. I’m far happier slobbing around in jeans and a sweater, most of the time. At least I can be me then. I learned a lot about colour and style when I had my style session a couple of years ago (which those of you who’ve been following this blog a while might remember), but I’ve been rethinking my attitude to clothes recently. All this ‘trying to be stylish’ business is just not me. Ultimately if I like an outfit and wearing it makes me happy, then why should I not wear it, regardless of what others think of it? It’s this attitude that prompted me to buy some biker boots recently. I haven’t yet had the opportunity to wear them, but I am looking forward to doing so. They might not be stylish, but I think they’re cool. I will endeavour to post a picture soon. In the meantime, make the most of this picture of me in my early 60s glamour, ready to go to the party. I don’t think it’s an outfit I’m going to be wearing very often – it requires far too much effort. I’ve been battling with my weight all my adult life. Over the last 20 years, I’ve been varying from size 12 to size 18. It goes round in a cycle. I put on weight, I go on a diet, I lose the weight and feel good, but the weight always finds me again. However, over the last couple of years I’ve come to terms with my body and all of its imperfections. Confidence has made a huge difference to my life recently. I believe confidence comes through maturity and wisdom, and there’s no short cut to finding it. 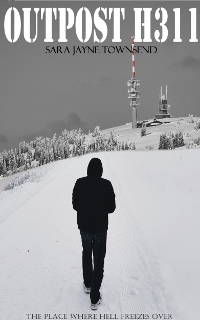 This picture was taken by my dad on the day before my 41st birthday, and I am including it because I think it’s a good contrast to the picture in my last post. There’s over 35 years between this picture and the previous one. When I think about that, it makes me realise just what a long journey it’s been between my being the little girl in that picture and the woman in this one. The skirt in this picture is a recent purchase. I used to have several similar ones in my wardrobe, that my stylist made me get rid of during my wardrobe detox. So I know that she wouldn’t approve, but I bought it anyway. Part of this confidence in the contemporary me is the conviction that if I like the way something looks, that’s a good enough reason to wear it. It’s been over 18 months now since I had my styling session, and I’m a size larger now than I was then. So much of what the stylist picked out for me no longer fits. But I am comfortable with who I am, and I can say with confidence that right now, in my 40s, I’m at a good place in my life. I can probably count myself lucky because not everyone gets this far. Life is short. You have to make what you can of it, and in the grand scheme of things, many of the trivialities we worry about – like putting on a few pounds – are really not important. The recent natural catastrophes in various parts of the world over the last few months have made me think about this quite a lot of late. None of us knows how many tomorrows we have left – so why waste today worrying about them? It’s now been a year since my fashion fix. If you haven’t been following this blog for that long, click here to gain an understanding of what I’m on about. I thought it might be a good time to revisit this subject (well, it works for Gok Wan). I’m not the kind of girl who buys a new wardrobe every season. I think I’ve probably mentioned this before. I wear clothes until they fall to bits – literally, in many cases. So, I am still wearing the clothes Joy picked out for me last year. I didn’t have an option to lapse back to my old wardrobe – it all went. I do, however, occasionally wear other things to work these days – things I suspect Joy would consider to be a bit too casual for the office. I’m not really a high maintenance kind of girl. Some days I really can’t be arsed faffing around with make-up, hair and jewellery – I just want to brush my teeth and go. When I shop for clothes, I try to remember the lessons I learned about the colours and styles that suit me. Immediately after my style session I was afraid to go shopping, because I had no idea what to look for. But I now have more confidence, because I’ve got a little more rebellious. I will buy things because I like them – not necessarily because they are things the stylist would approve of. With regards to accessories, well it was fairly obvious that wasn’t going to last. I don’t wear the chunky jewellery much these days. Big beads click together and bang against my chest in a way I find really annoying. I still prefer my own jewellery, unstylish though it may be. I’ve stopped using the ‘stylish’ handbag, and gone back to the old faithful brown shoulder bag that I can sling over my head to keep it secure on my daily commute. The ‘stylish’ bag doesn’t hold everything I need to take to work with me, and it keeps sliding down my arm in a most annoying way. I didn’t get rid of any of my shoes, in spite of them all receiving a ‘thumbs down’ from the stylist. I keep the ‘work’ shoes she picked out at the office, but I hate wearing them. I just can’t walk in them. I do wear the ballet pumps, however. A year on they have now sufficiently softened up to not rub my feet. It’s safe to say that I have lapsed somewhat. I think there’s an irony in the lesson I did take away from my style session – the most important thing about your clothing is that you feel good in it. It doesn’t matter how you look to everyone else. If you look in the mirror after getting dressed in the morning and think you look good , hold your head high and step out, and ignore what everyone else thinks. And this, for me, reinforces the most important lesson in life. Be true to yourself. I don’t like the cold, as I’ve mentioned before. I’ve been bundled up in thermal vests, sweaters and socks for months now. Last week, I reported on signs of Spring being visible, in spite of it still being quite cold. This week, it’s arrived without notice. Last week I was still wearing my scarf and winter coat. For the last couple of days I’ve been wearing my rain coat, but I had the afternoon off today and as I arrived back home I was surprised to discover I was actually feeing quite hot. It’s 15c in London today, and it seems that the season has changed all of a sudden. This time last week, I think it was about 7c. The winter duvet is still on the bed, and the radiators are all still cranked up to maximum. This change of weather is refreshing, but it’s taken me by surprise. I’ve just gone through the house opening up windows. It’s the first time they’ve been open since September – some of them were a bit stiff (I’m not one of these people who sleeps with the bedroom window open all year round – I am generally opposed to fresh air if it’s cold air). My ‘slobbing at home’ outfit consists of a t-shirt with my jeans instead of a sweater, for the first time in months. Winter seemed to go on forever this year, but I think we can finally say we’ve seen the end of it. Perhaps it’s safe to put away my sweaters and dig out all the clothes my stylist picked out for me last year, most of which I haven’t worn for months because it’s been too cold. Springtime in England can be wonderful. I’m so happy it’s finally here. Most of the UK has had more snow the past few days. Here in London, we’ve been quite fortunate. We’ve had no more snow. We are, however, getting rain. Lots of it. Heavy and unrelenting. And carrying an umbrella doesn’t help much. It might keep the rain off your face, but the rest of your body gets soaked, and the pavements are all so wet you get a lot of splashback to soak your trouser cuffs. The drains are clogged – the rain runs in rivers down the side of all the roads, and avoiding getting splashed by passing cars is a tricky operation. The rain has been falling, more or less continuously, for about four days now, and it is forecast to continue for the rest of the week. Although I much prefer rain to snow, it is hard to stay upbeat when you’re being relentessly pounded by rain. I have discovered I don’t own a coat or a pair of shoes that can cope with such unremitting rainfall. My nice stylish wool coat is still drying out, after it got a soaking during my journey home from work on Thursday. My unstylish Parka – allegedly waterproof – got drenched when I wore it to walk to the sports centre for my usual Sunday morning swim yesterday, and it’s still wet. So now I am down to my wax-coated rain coat, which is atrociously unstylish. It doesn’t have a hood, but it does cover most of my body. So between it and my brolly, I can keep mostly dry apart from everything below my knees. As I seem to possess no waterproof shoes, I have resorted to commuting in my hiking boots, which are at least thick enough and sturdy enough for the water to not penetrate through to my feet. Yes, I probably look like a bag lady as I trudge through London this way. At this point, that’s the least of my worries. My aim is to stay as dry as possible. It’s hard enough to face down Mondays as it is, but rainy Mondays are even worse. Maybe I should go the whole unstylish mile and get myself a pair of green wellies to commute in. We’re not in winter yet, but we’re close. I think I must be part bear and part lizard – I want to hibernate when the cold weather sets in, and I feel the cold – I’m the one shivering in two sweaters when everyone’s peeling off layers. But it’s got decidedly chilly in London over the last couple of weeks, and I’ve been digging out my winter coats. I have three coats that I wear in winter. I’ve got a rather stylish wool coat that we bought in Paris a couple of years ago. It’s warm but not waterproof. I also have a long rain coat – also reasonably stylish. Good for keeping the rain off, but not very warm – it’s more an Autumn coat. And then I have my trusty old parka, with its unflattering furry hood. Even I can tell it’s really not stylish at all. It’s warm and it’s waterproof, and the hood makes me feel like a Shire horse – it has the same effect as a horse’s blinkers and I have no peripheral vision when it’s up – but it keeps the rain off my head. There are some days when I think it’s more important to be warm and dry than stylish. I keep this old parka for these days.